To ensure access to a broad range of well qualified participants, WB Surf Camp encourages those who need financial assistance to apply for partial scholarships to participate in our summer learn to surf overnight camps, day camps, and marine biology adventures. Our Financial Aid committee carefully considers several factors, including family income, ethnic, racial and cultural diversity, teacher references, student essays, and commitment to the program as reflected in the application. Our goal is to empower financially disadvantaged students by helping them experience physical accomplishment, become more environmentally conscious, assume leadership roles, and build self confidence. Our program changes lives! The deadline to receive financial aid applications is still open. If you have previously received financial aid, please do not assume that the same award can be offered again. We strongly believe that everyone should have the chance to experience the magic of surfing and its connection towards coastal conservation. Every year we award thousands of dollars to deserving participants. All you have to do is apply, and we will do everything we can. Any student is eligible, but we only have a limited number of partial scholarships and they will be awarded to those with the most demonstrated need. If your household makes over $50,000 annually, it’s unlikely that you will be awarded a scholarship. We requires a completed application, two teacher references, letter of intent written by the student, and the family’s most recent 1040 form. What programs can financial aid be used towards? Financial aid can be used for all of our kid, teen, and family camps. We only offer partial scholarships, up to 75% off the tuition price. Not included in the price reduction is the cost to transport the student to camp and any additional spending money. April 1. However, because our full pay customers come first, the program that you want may no longer be available. To secure a spot in the camp of your choice, you would need to put down a deposit and be prepared to pay the full tuition should you not be awarded financial aid. What if it’s after June 1 and I haven’t heard anything? Please be patient with us as we are still finalizing program placements. You will be notified by either phone or email about your status. All questions should be directed to one of our reservation specialists at info@wbsurfcamp.com. No phone calls please. We’ve created a unique, community-based initiative to help offset the cost of camp tuition. Bags for Bucks offers students the ability to create positive change in their neighborhood through the simple act of cleaning up litter and recycling the waste. This is a great way for you to beautify your neighborhood areas, do something great for the environment, and earn your way towards attending one of our camps. To get started with Bags for Bucks, talk to your friends, family, and maybe even local businesses, to see if they would be willing to sponsor you. Each sponsor will determine a dollar amount they want donate for each bag of trash you collect. 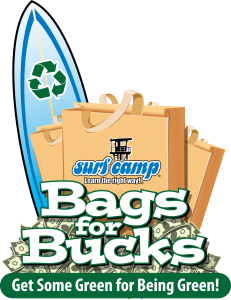 For example, if your Uncle Joe will sponsor each bag at $5 and you collect 20 bags of trash, then you just earned $100 towards your camp! So, the more sponsors you get and the more trash you collect, the more money you earn towards your camp tuition. For students interested in the Bags for Bucks program, click here. For sponsors interested in the Bags for Bucks program, click here. As you can imagine we get many requests for charity donations every year. Although our programs have an international range, we give priority to donation requests from our local community.